Around the time that this metaphor of carrying packs on a journey and it’s relation to daily life came to me, I was talking with my husband about how I was discouraged with how we’ve been doing things, how life’s been going. I told him I didn’t know what needed to change but that I felt our current life wasn’t sustainable for much longer. His response surprised me. He agreed that what we were doing wasn’t sustainable. But instead of worrying about it, we just need to rely on future grace – God’s grace to keep us going, grace to get us through each day. You see, a couple of years ago, John Piper did a seminar on a book he’d written on this topic and we watched it live online together. I’d already learned this, and then just as quickly forgotten it when life got rough. I knew immediately that Jeremy was right. That the things which need changing in our lives are of a spiritual nature more than of a physical nature. A spiritual change could lead to the much needed physical changes in our schedules, routines, and workload. I have been re-listening to Piper’s seminar and reflecting on how I can better rely on God’s grace and provision to get me through each moment. It has been encouraging to review what the Bible says about how to thrive when God tries us in the furnace of affliction. And it’s a great reminder that the trials of this life are for His glory. The statement that’s hit me the hardest so far (I’m about halfway through the first part of the seminar), is part of the opening prayer. He prayed that we “not go blundering ahead with any sense of self-sufficiency or self-reliance in this moment.” In a moment of self revelation, I saw how this is exactly what I’ve been doing – blundering ahead in self-reliance. My eye has been on the wrong thing as I hike down the trail. I’ve been looking down at my own feet, or complaining about the heavy load instead of looking forward to the view at the top of the mountain. Instead, I need to put my hope in Christ each morning, that He should sustain me. Here’s the thing about me: I’m tenacious. It’s often seen as a character trait. Some synonyms for tenacity are persistence, determination, perseverance, tirelessness, resoluteness, resolve, patience, purposefulness, steadfastness, staying power, endurance, stamina. Tenacity sounds good to have, right? It can be. I’m learning more and more that it is just as easily a character flaw. 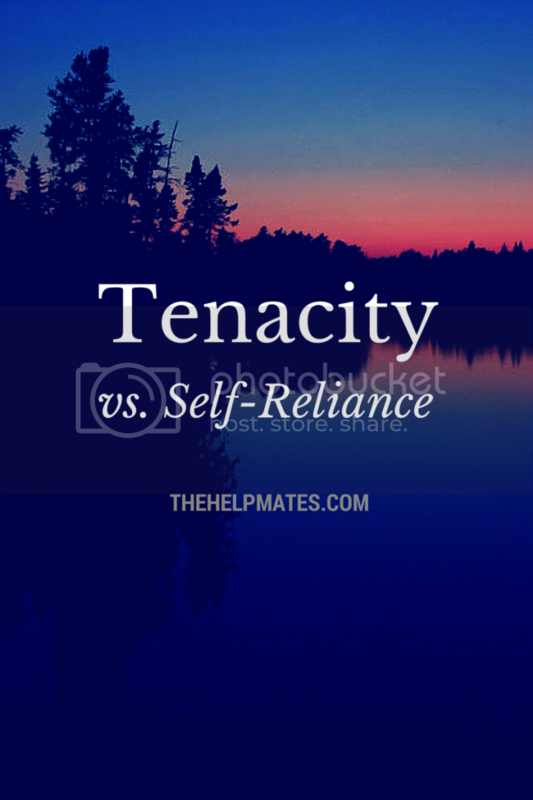 Because tenacity taken one inch too far is self-reliance, self-sufficiency. If my treasure lies in getting my checklist of to-do’s done for the day, in being mom of the year, in running a booming business, then I’m going to end each and every day disappointed. But if my treasure is in Christ – what He’s done for me on the cross and what kind of difference that makes for me today and tomorrow – then I end each day amazed, grateful, fulfilled. This week I have been waking up each morning to begin the day by getting my heart satisfied in Jesus. This way, I begin each day filled with the grace of God, so that I can pour out His grace into my husband and children instead of beginning each day empty and trying to fill myself with the work my hands are doing. The days have still been long (and I’ve been fighting a cold that’s turned into a sinus infection) but they have also been full – with love, with provision, with the promised grace to get through each moment as it comes. 5 Not that we are sufficient in ourselves to claim anything as coming from us, but our sufficiency is from God. I'm Lisa's sister, a wife & mom of two little boys, and a small business owner, trying to make each day count for God's kingdom.